Your website is an interface for buyers and sellers of any goods. The goods may be ordered via a computer, smartphone, tablet or any other mobile device. This website terms and conditions template sets out the relationship between you and your sellers who put up goods for sale on which commission is paid to you. Because each marketplace website has its own business model, we provide separate agreements for terms with buyers and sellers. You should therefore pair this document with the most suitable buyer side marketplace T&C document we offer. This template is for any website that creates a marketplace where physical goods are sold. It doesn't matter what type of good is sold, provided that it is a 'physical' good and not downloaded. Your site could connect buyers and sellers of small 'consumer' items such as rare coins or electrical homewares or large items used by businesses, such as office equipment or mechanical plant. websites that create online shop fronts for manufacturers, wholesalers or producers where the product descriptions are controlled by the seller. operate in the Republic of South Africa. Sellers and buyers could be located anywhere in the world. connect buyers with sellers. Your business should not also be a seller, nor should it hold stock or fulfil orders on behalf of sellers. provide payment facilities, collect taxes and fees and reimburse the seller the net sales value. have sellers that are paid on: a commission basis; a transaction fee basis; through advertising; or not at all. allow sellers to upload their own product pages or product advertisements. provide an advertising service to sellers. have regular sellers (for example, ones that operate their business from your site), or allow one-off sales. Sellers could be in business or be transacting privately. This document only provides the terms between your business and sellers that sell goods through your marketplace website. You will need a matching document that regulates the relationship with buyers and other site visitors. If buyers are required to subscribe (or become members) of your site before they can access the marketplace, then you should use Website terms and conditions template: marketplace for goods; buyer subscribes for access in conjunction with this one. If there is no requirement for buyer membership before purchase, then you should use Website terms and conditions template: marketplace for goods; buyer side. 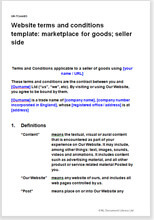 If your site creates a marketplace for services, not for physical products, Website terms and conditions template: marketplace for services; seller side should be used instead of this document. This template allows you to comply with the Electronic Communications and Transactions Act 2002. .,.The Consumer Protection Act 2008 and other latest consumer protection legislation allowing your sellers to sell to businesses or consumers. The terms and conditions template includes provisions that cover both the relationship between the seller and the buyer and the relationship between your business and the seller.